Hey guys! I hope you're doing well on this fine Wednesday. I know that I sure am! I've been practicing yoga, meditating, reading, writing, and spending lots of time with my loved ones. Honestly, I can't remember a time in my life when I've ever been this happy. My heart is so full, that it feels as though it could burst. So much love. Don't get me wrong, things are not perfect (not even close), but one by one, I'm crushing my fears. And it feels so damn good. My first week of university, I marked my skin with the words, "Viva Hate". It's actually a Morrissey tattoo, and "Viva Hate" was my favourite album. But the words ran deeper than that. I was a sad teenager, and had turned into a very angry young adult. Well, it's eight years later... And I'm not so angry anymore. I still love Morrissey, but I don't love those words. I don't regret my decision per say, but these faded marks don't make me happy when I look at them (ugh... that script looks so bad now). I've spent a lot of time thinking about whether or not to cover this tattoo, and I've finally decided that I am going to turn it into something really beautiful. I've held off for a long time, for multiple reasons. But if not now, when? I want to love every part of my body and soul, and so, now is the time. I made a mood board, because, well I'm a nerd. The two "Now My Heart is Full" tatts belong to my BFF's. The heart + sunflowers is Brie, and was done by Aaron Hill (years ago) at Good Point Tattoos (he's now at Speakeasy in Toronto). The rose is my bud Nat, and the tattoo is by Glennie W. (also a few years ago) at Pearl Harbor. All of the other tattoos pictured are by Alex Strangler (except the triple flowers, but I found that without a name on Pinterest). Hopefully one day I will get under Alex's needle. But for now, I'm hoping some local talent can work with what I've got. I'm going to add a geo flower (or two) and a banner saying, "Now My Heart is Full", (which is actually another Morrissey song). I just want something really bright + beautiful. Yeassss!!! Let's do this. I'm probably way too excited. Hey guys! I know Tuesday's are typically TUNED IN - but I've got something big planned for next week, so I thought I would share some of my progress with a new client that I'm really excited about! 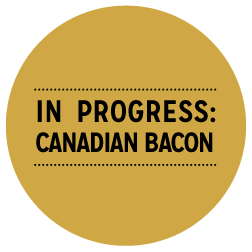 A couple of weeks ago, I was offered a contract doing branding for a new restaurant opening in my hometown (Oakville, ON - it's a suburb of Toronto), called Canadian Bacon. We've been working hard on coming up with a logo, and getting a menu designed. But I thought I would share the moodboard that we developed. We were going for a rustic, but refined look. I think we accomplished that - how about you? I'm also a little obsessed with the colour palette - it's just the perfect shade of mustard. Want to support Polka Dotted Pixels elsewhere? Follow me on Bloglovin', Pinterest, Twitter, Instagram + Dribbble!